1 Using JMRI, create a throttle from the Tools menu and verify that it can control a locomotive. 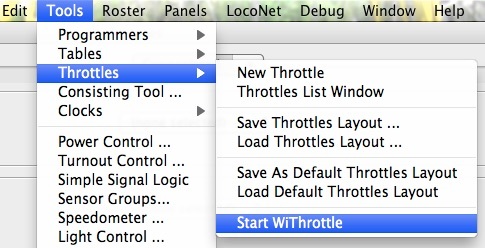 2 In the Tools menu, go to Throttles, then select Start WiThrottle. 3 The word pending... will be replaced by the computer name. 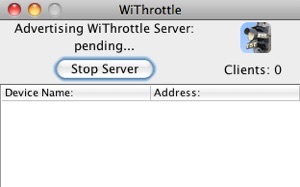 The WiThrottle server is now running. Start WiThrottle can be set as an automatic startup item or as a main window button in the WiThrottle section of JMRI preferences. The server computer needs to be set so that it does not sleep (hibernate) during operations. Firewalls block the app from connecting to the host computer. In the event of a connection issue, this is the most likely cause. The firewall would need to either be disabled, or grant permission for the iPhone, iPad, or iPod touch to connect. 1 Connect the Prodigy WiFi module to your MRC Prodigy system. 1 Connect the LNWI module to your Digitrax LocoNet. 2 Connect the LNWI power supply. If prior steps are successful, the server is functioning. You are now ready to purchase WiThrottle on the App Store™. Or if you prefer, you can try WiThrottle Lite for free. The Manual indicates which features are only available in the paid version of WiThrottle. AJMRI - the local Wi‑Fi network. BProdigy WiFi - the network name beginning with "MRCWi‑Fi"
CLNWI - the network name beginning with "Dtx"
2Launch WiThrottle. It should automatically connect to the server. 3You will then have the address screen visible. Tap the text field (New Entry) to get a numeric keypad to enter an address. You can also select whether it is a short or long address. Tap Set when finished to request the address. 4If the address appears in the top left corner in a green box, you have control of that address. 5On the tab bar at the bottom of the screen, select Throttle. The iPhone, iPad, or iPod touch will not sleep on its own while the app is running. The sleep button on top of the device will put it to sleep, but it will take it time to reacquire the network when awakened.